It was only in the early 1990s that carbenes with the carbene carbon being incorporated in a nitrogen containing heterocycle (N-heterocyclic carbenes or NHCs) were found to be stable enough to be isolated. Since the first report on the application of NHCs as ligands in transition metal catalysis in 1995, NHC have found numerous applications and have been established as a versatile and indispensabl… e class of ligands. For many reactions like metathesis or cross-coupling reactions NHCs have often become the ligands of choice, allowing otherwise difficult transformations. 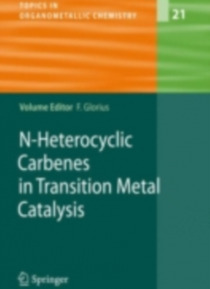 In this book leading experts have surveyed major areas of application of NHC metal complexes in catalysis. The authors have placed a special focus on nickel- and palladium-catalyzed reactions, on applications in metathesis reactions, on oxidation reactions and on the use of chiral NHC-based catalysts. This compilation is rounded out by an introductory chapter and a chapter dealing with synthetic routes to NHC metal complexes. The use of NHC as ligands in catalysis has reached a certain level of maturity and this book allows the reader to get a balanced view of this increasingly important ligand class.